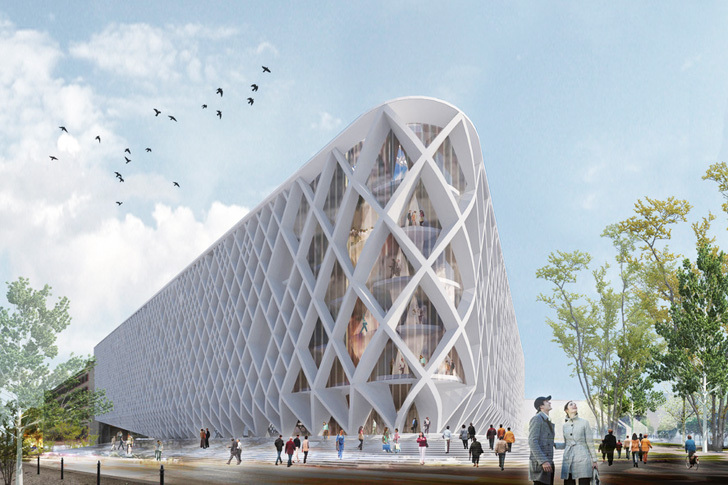 CVDB Arquitectos‘ proposed National and University Library of Ljubljana building (NUKII) is a symbol of knowledge and culture as well as an archive for historical and national heritage that constitutes a precious legacy in Slovenia. The new energy-efficient, V-shaped building is intended to resemble the shape of a standing book. The new library will be built above Roman ruins, which will be both preserved and showcased beneath a protective transparent shell. The proposal is based on a bioclimatic planning strategy that directly connects design and energy efficiency. The facade incorporates a sun-shading system of varied density and depth that maximizes energy gains in the Fall-Winter period and minimizes energy gains in the Spring-Summer period. The gradient facade can be considered as a 3-in-1 element that naturally combines the programmatic, structural and bioclimatic concerns. The geometry of the building responds directly to the urban condition of the site layout. The core of the plan is marked by a central void where there is a system of wide public stairs that connect the different levels and lead to the winter garden-like terrace on the last floor, which offers an overwhelming view of the castle and the city. A large dome of crossed metal beams is constructed over the ruins, freeing the space from any vertical structural elements. 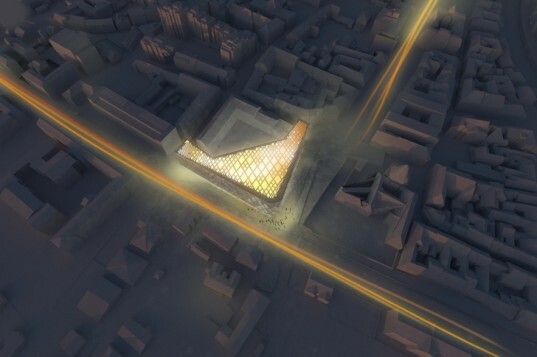 At the same time it creates a transparent platform that will provide clear views into the ruins from the surrounding streets as well as from the ground level of the library. A structural facade is proposed to eliminate the need for any central vertical elements (pillars) – this allows the creation of large open areas in the center of the building. The structural facade rests on the dome podium in a natural flow of load bearing forces that are oriented towards the periphery. CVDB Arquitectos' proposed National and University Library of Ljubljana building (NUKII) is a symbol of knowledge and culture as well as an archive for historical and national heritage that constitutes a precious legacy in Slovenia. The new energy-efficient, V-shaped building is intended to resemble the shape of a standing book. The new library will be built above Roman ruins, which will be both preserved and showcased beneath a protective transparent shell.